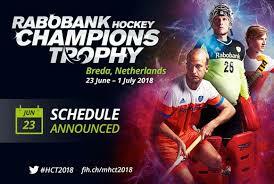 The 2018 Men’s Champions Trophy event has been scheduled in Breda, Netherlands from 23 June to 01 July this year. This is the big event of hockey and it is played among six top teams of the world. Pakistan will participate in this event and there are five other teams like Australia (defending champions and 2014 world cup champion and 2016-2017 world league champion), Netherlands (Host nation), Argentina (Champions of 2016 summer Olympics), while three teams of India, Pakistan and Belgium are invited by FIH executive board. Pakistan will play the first match against India on 23 June at 1400 hours local time. 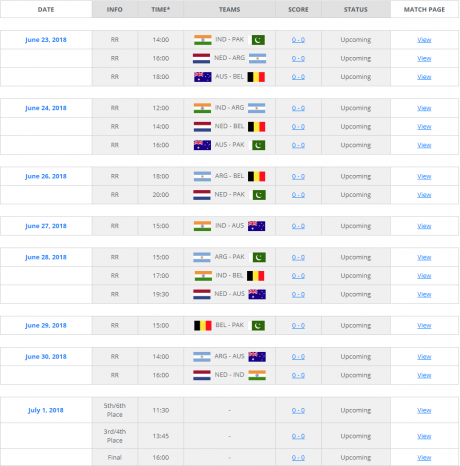 Pakistan will play against Australia on 24 June, against Netherlands on 26 June, against Argentina on 28 June 2018 and final match against Belgium on 29 June 2018. The position matches will be played on 01 July and the last match will be the final of this mega event.